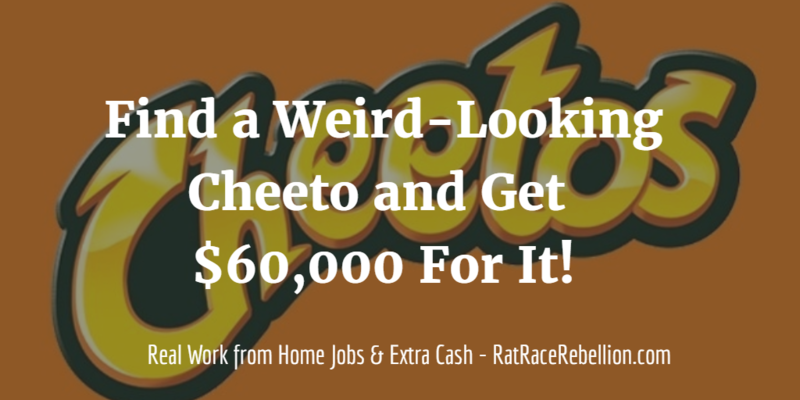 Get $60,000 for That Weird Cheeto! If you’d like $60,000 in extra cash, don’t swallow that weird Cheeto. As you may have seen, Frito-Lay is offering big bucks through Aug. 15 for oddly-shaped Cheetos. Basically, did you find one that resembles a famous person, an animal, an object in everyday life? Just take a photo and write a brief description, send them in, and you could be $60,000 richer. Every week for ten weeks, Frito-Lay will give a winner $10,000. Then consumers will vote for the grand-prize winner, who gets an additional $50,000. For details, click here. For some examples already submitted, click here. ♥ Share the Weird Cheeto Love! Know a Cheeto lover? Please share the post. They’ll love you and we will too! Thanks! This entry was posted in Earn Extra Cash. Bookmark the permalink.